According to the China Brand Research Center’s 2014 China Brand Power Index, Apple replaced Samsung as the leader in the Chinese mobile sector this year. These results were garnered through polling about brand awareness and loyalty. Argus Insights found that Apple’s usurpation of Samsung’s top spot in the Chinese market was inevitable. Consumer review data proves that China Unicom customers have been more delighted by Apple than by Samsung for over a year now. Argus Insights data preceded the results of the poll as consumer experience foretold subsequent brand perception. Apple has been consistently better delighting consumers in the Chinese market, and as this trend persists, Apple as a brand is becoming increasingly popular. 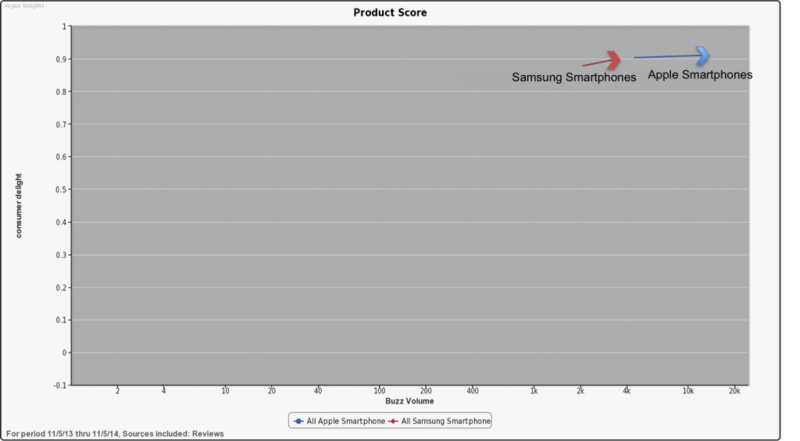 CNet analysis suggests that Samsung is losing favor “due to a focus on market share leading to falling consumer loyalty,” and Argus Insights tracks exactly that. Samsung is continuing to acquire higher review volumes, but is failing to please individual customers, as much as Apple is, in the process. Brand indexes tend to lag market performance as hope in the brand promise persists even after brands fail to deliver on that promise as was the case with Samsung. Argus Insights listens to consumers to track how mindshare relates to marketshare. We have found on several occasions that consumer delight, as calculated from reviews, is a strong indicator of adoption and loyalty, as it was for Apple in the Chinese smartphone market. Read about how this affected Samsung’s big screen TV sales during the holiday season of 2009, and how Argus Insights helped Samsung sell more TVs, in our case study: Samsung Discovers Their True Competition to Improve Sales. For more information about how to harness consumer feedback to improve your business, personalized analysis, data access, or individual consultation, please contact Argus Insights. To see the effect of Apple’s iPhone 6 and 6 Plus launch on the Smartphone Market, take a look at our September Smartphone Market Report. For just a WinkTM of insights to stay informed between blog posts, sign up for our Free Weekly Newsletter.